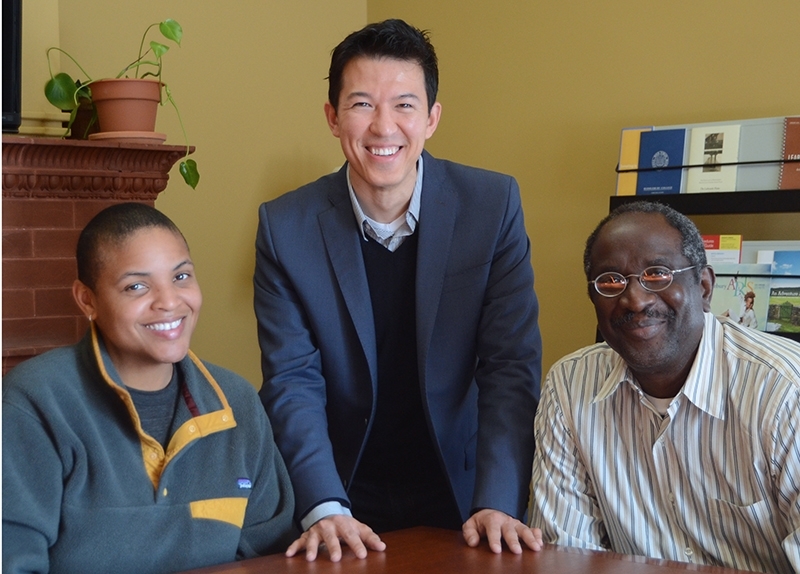 From left: J Finley, Alvin Henry, and Nathaniel Nesmith are C3 post-doctoral fellows at Middlebury. Recently three faculty members – J Finley (American Studies), Nathaniel Nesmith (Theatre), and Alvin Henry (English and American Literatures) – came to the Communications Office in Kitchel House to discuss their impressions of Middlebury after teaching their first semester at the College. All three have new two-year post-doctoral fellowships offered by the College in conjunction with C3. Funded by the Andrew W. Mellon Foundation, C3 – Creating Connections Consortium is a partnership among several colleges and universities with the goal of diversifying faculty in higher education and allowing students and faculty from all backgrounds to advance along the academic pathway. To follow is a condensed version of the second half of the conversation. The first half is posted in the News Room here. What is it like to teach at a school that’s in such a rural setting? J: The class that I was teaching was a class on African American humor and a lot of it focused on stand-up. I really like for my students when I’m teaching this class to go to a comedy show to experience live comedy performance. So you’re in Vermont and it is hard – you have to go to Burlington [for stand-up]. I ended up having to bring the talent into Middlebury. Bringing outside activities that really relate to the course curriculum is something that I have been able to do here at Middlebury. I definitely don’t think I would have been able to do that at Berkeley because this is such a small place and there’s money and opportunity to do it here. Alvin: I arrived in the summer and I like to do outdoor activities so I just was like, oh wow, let’s go running, let’s go biking. I grew up in rural Texas areas and it was very white and it was very small, so I was used to being the only person of color around. [J and I] We’re going Alpine skiing next weekend. [Laughs] So we’re integrating. Nathaniel: For some reason it hasn’t been that drastic of a change for me, I guess because the only thing that surprises me about the area is how consistently cold it is. What I find interesting about Middlebury is that there’s always something going on on campus and I really like that. Alvin: The small ruralness aspect is also helpful because the students are also in that context. They actually will want to come talk to you and come to office hours for extended periods of time and email you just like, “Can I come talk?” So it does foster better relationships with your students, very productive ones where they will want to come talk about their scholarship or their future plans. So it’s actually a very positive thing to be isolated. After teaching here one semester, what has surprised you the most? Nathaniel: I actually second that because I find that the classes are very short. Alvin: I think I was surprised in the sense that I thought these would be elite students, but in my head I never kind of pictured what that would be because Berkeley students are pretty elite too, but I was surprised at the great conversations we had in class. It was mostly student-run. So for me as a teacher that was what you dream of, to have the students really dialoguing with each other in critical ways and [to see] just how curious they were with the materials. Do you have any advice for prospective C3 post-doctoral fellows? Nathaniel: If you love teaching, if you’ve honestly decided this is what you want to do, I think regardless of where you go you have to give all that you possibly can to the students. Because you want people to gain. Alvin: I guess the advice that I have for the post-docs is to imagine – at least at Middlebury; I can’t speak for [the C3 post-docs at] Williams or Connecticut [College] – that your classroom should be like a laboratory for you to test out new pedagogies because this place is supportive of innovation and trying out new things. You might fail, but I think this school welcomes innovation and interdisciplinary approaches, or if you want to be straight up disciplinary. So just letting them know that this isn’t the bastion of an old-school world. And for the undergrads [considering graduate school or research as C3 fellowsl], my advice is to work with one of us once they get here because we came from the schools that they could go to and we can guide them along. Use us as a resource or for developing a research plan either here or at Columbia or Berkeley. Have you had an “a-ha Middlebury moment”? Alvin: I have two a-ha moments. One is when I wake up my alarm clock tells me the temperature. So when I wake up, it’s minus two or minus five and it’s [been] like that for the past couple of weeks. It doesn’t shock me any more. I never thought that was possible. I didn’t even wear a hat today when I was walking over. I’m getting rugged. But my a-ha moment in the classroom was probably when I was able to set up the classroom and give the kids a question and I was more like a facilitator. They just kind of took off on the debate. They were arguing with each other. They were picking apart the ideas and I really could just step back. They know how to process ideas and interact with each other. So that was really exciting for me. J: That first snow around November. That’ll let you know that you’re in Vermont. It snows here like it rains in other places. So that’s Vermont for you. The sustained coldness – that’ll let you know that you are in the special place. Nathaniel: My a-ha moment is the diverse class that I had. That was very, very interesting and that was very surprising to me. I guess it was because of my naïveté and what I thought I expected coming to a new state. I could have had this as a class in Manhattan.